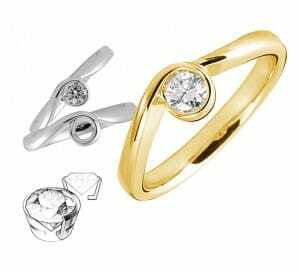 A good number of couples choose their engagement rings based on the quality of the stone and the design of the setting. Because of aesthetics, design is often a major factor in the selection. However, a wise couple will realize that there is more to a setting than meets the eye. The quality of a setting depends on the way the mounting is constructed, regardless of style or design. Jewellers have used less than a dozen basic settings for hundreds of years. These basic settings are embellished and enhanced to keep pace with trends and fashions as these come and go. The prong setting is the most frequently used mounting for gemstones today, especially for solitaire engagement rings. 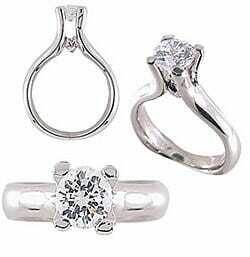 In this type of setting, three or more prongs hold the diamond securely. The ends of these prongs are bent over the crown of the stone, and sometimes these prongs are etched or shaped decoratively to give a round stone the appearance of a square cut gem. Depending on the way this mounting is constructed, the diamond can be lifted considerably above the band or nestled close to it. In general, prong settings are used to produce dainty and delicate pieces of jewellery. This setting allows the diamond to take centre stage. When the prongs are fine, more of the diamond shows, and the stone is able to reflect more light. Prong settings are generally less expensive because they are simpler and easier to make. The girdle of the stone is exposed and unprotected. 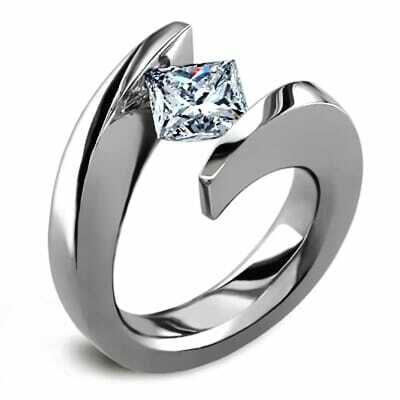 If the prongs are set too high, there is greater risk that the ring will be snagged and the stone loosened. If the prongs are not sturdy, there is a possibility that one of them could break or get pried open. If you are bent on choosing a prong setting, make sure that the prongs are even in height, and the stone is squarely and securely set. Choose the sturdiest prongs possible, and make sure the surface of the ring has no sharp or jagged areas that would make it more prone to snagging. With the tension setting, the stone is held in place through pressure. Because the metal band holds the gem without supporting prongs, the gem looks as if it is floating. This setting is only appropriate for extremely hard stones such as diamonds, sapphires, and rubies. The absence of a bottom allows a lot of light to enter through the gem so a good sparkle is produced. If the ring’ss gem is held securely within the setting and not allowed to protrude, there is little likelihood that the stone will be snagged and come loose. If set correctly, stones are quite unlikely to fall out in a tension setting. The ring cannot be resized or repaired easily since this would change the level of tension holding the stone. The girdle of the stone is left unprotected. 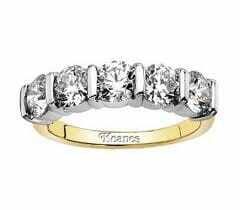 An ordinary, straight wedding band would not fit snugly next to the irregular angle of this setting. The Bezel setting is one of the oldest types of mounting used by jewellers. The diamond is secured around its perimeter with a strip of metal that is bent over the gem’s girdle without covering any part of its table. This Bezel is now being successfully crafted to look like it has been combined with other mountings. The half-bezel setting is an example of this. By allowing the bezel’s lip to cover only parts of the stone, the setting looks like a modified tension setting. The metal strip round the diamond will make it look bigger. The metal strip will protect the girdle of the diamond. New technology now allows a more precise trimming of the metal so that there is only a very fine lip around the stone, and this can now be polished to a finish that makes it flush with the diamond. This setting is generally more expensive because it takes more metal and work to create. Clear gemstones can lose some brilliance because the metal covers the girdle of the stone. Opaque stones such as jade and opal may actually be better stones for this setting. The Channel setting sets a row of diamonds between two horizontal metal bars without prongs or any other framing to secure the gems. 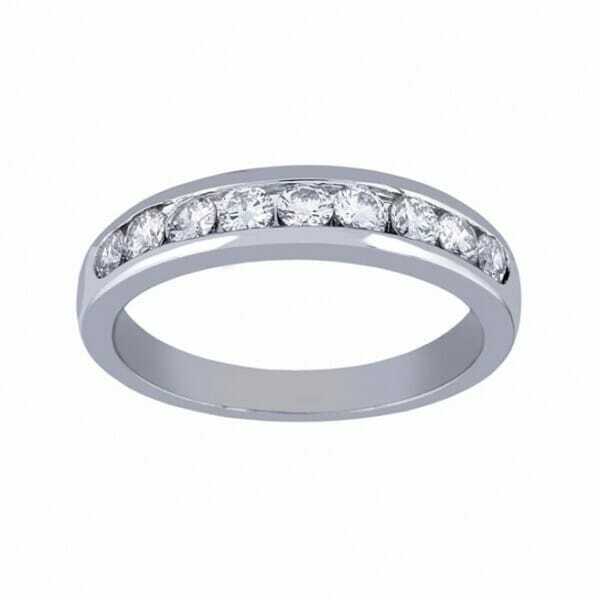 This mounting is very popular for wedding bands with diamonds as centre gems. The girdle of the stones is protected with this setting. Small stones are more secure with this setting. A smooth surface is achieved with this setting – one that has less chances of snagging on some piece of cloth. This setting is not easy to resize, especially if the stones run all the way through the band. This is not a recommended setting for softer stones such as emeralds and rubies. The bar setting uses prongs to secure the stone but these are elongated on two sides while leaving two sides free. These prongs come out like thin vertical on the each side of the stones. This setting protects the girdle of the stones. The resulting surface is relatively smooth and easy to wear for people who live active, busy lives. Like the Channel setting, the bar setting has a streamlined contemporary look which will not easily go out of style. This usually costs more than an ordinary prong setting. The crevices are harder to clean than an ordinary prong setting. 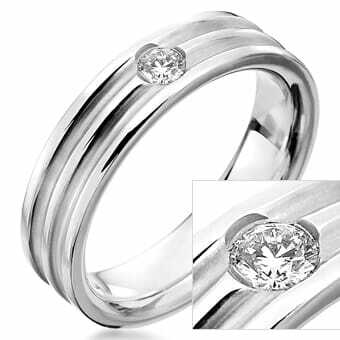 If the bars protrude, the ring may be uncomfortable to wear. The gems in a pave setting engagement ring are imbedded into holes in the metal. The metal around the stones is then carefully raised using fine tools to seal the stones into the band. Usually multiple small diamonds are used in the pave setting. This setting makes the stones look bigger than they would if they were to be placed in another setting. The metalwork makes it seem like there are more diamonds than the actual number in the setting. This setting only works well with hard gems like diamonds and sapphires. If the metalwork is not smooth, there is danger that the ring could get caught in clothes or similar material, and the stones could be pried from the setting. The Gypsy setting is also called flush or burnish setting, names which are now preferred because they are deemed more politically correct. Stones are set into holes in the wedding rings, and then a burnishing tool is used to push the metal around the stones. This setting can hide flaws better than a simple prong setting can. This lends itself well to rings for men. Expect rings with this setting to be more expensive because of the time needed to do them. Like some other settings, this works best with hard gemstones. There are so many settings to choose from today when couples decide to pick an engagement ring. 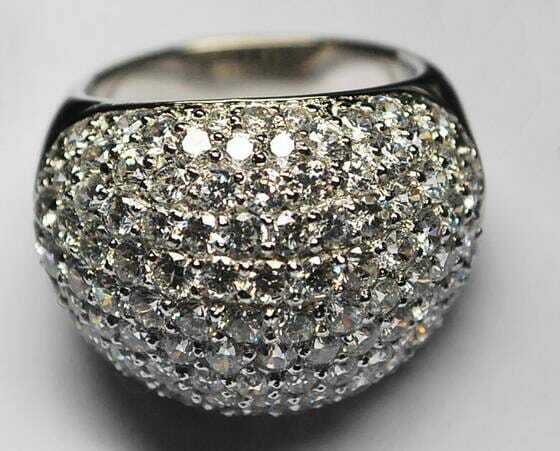 Many choose based on the quality of the center stone and the design of the ring. Some however, will look at the rings on display and think of the many factors involved in the construction of their ring’s setting. Hopefully, their thoughts will include questions about sturdiness and practicality. The engagement ring should be as beautiful and attractive as possible. However, over and above this aesthetic consideration, a couple would do well to remember the engagement ring is more than just an accessory. It is a symbolic piece of jewellery that should be built to last, and it should be a ring that can stand a lot of wear and tear. In this respect, the ring becomes a reminder of what an engaged couple’s relationship should be like.